Can the Aussie dollar still diversify risk? “it was one of the most profound economic policy decisions in Australia’s modern history”. The Australian dollar’s sharp swing weaker to USD 0.60 in the mid-1980s, the ‘banana republic’ era, helped the economy adjust to a credit rating downgrade. A fall below USD 0.49 in the early 2000s helped Australia respond to much slower growth, as the economy was deemed ‘old economy’ at the height of the US tech boom. And then there was the sharp swing stronger to above USD 1.10 at the height of the commodity boom, helping to avoid overheating as our ‘old economy’ became wealthy on the back of China’s insatiable demand, and we basked in the afterglow of a more than 300% rise in the price of Australia’s non-rural commodity exports. The Australian dollar has also been a useful tool for diversifying risk in offshore equity investments, often partly insulating negative returns when global markets correct lower. Indeed, since its float, the Australian dollar has had a positive correlation with the US equity market (thus, partly insulating losses) 60% of the time, rising to over 70% of the time since 2005. While we remain cautiously engaged with risk, despite recent market corrections, we remain overweight global equities where we see stronger momentum in economic and earnings growth. But with the US dollar on a weak trend, and some forecasts for the Australian dollar for 2018 as high as USD 0.85, can the ‘little Aussie battler’ still play a role in diversifying risk? For most countries, increasing domestic interest rates is typically thought to put upward pressure on that country’s exchange rate, as it makes ‘returns’ on investments relatively more attractive than elsewhere. 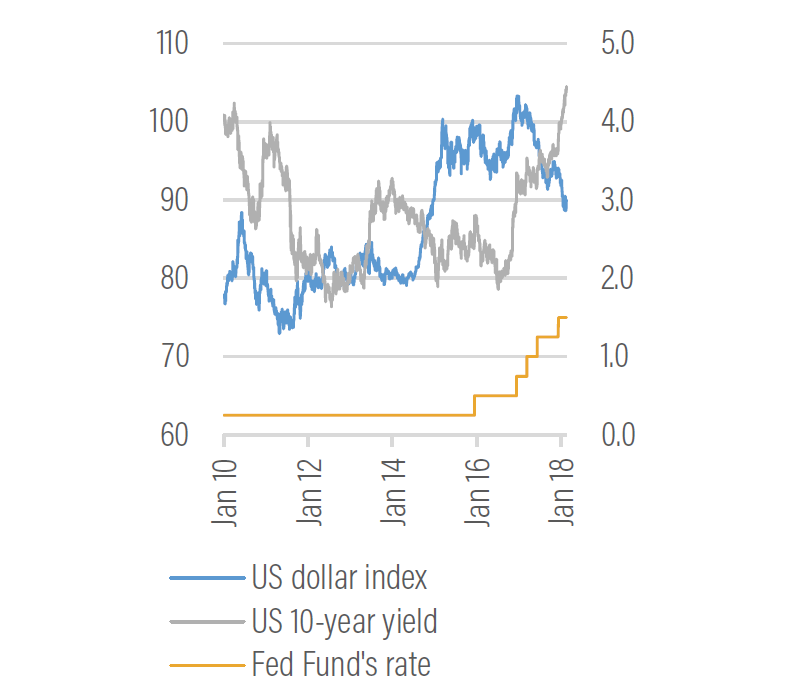 However, for the US dollar (see chart opposite), there was little evidence through the 2013 ‘taper tantrum’ (when US bond yields rose sharply) or through 2017 when the US Federal Reserve (Fed) started lifting the policy rate, that the US dollar garnered any such benefit. Indeed, the US dollar generally trended weaker through both of these periods. The near 20% strengthening of the euro against the US dollar through 2017 to USD 1.25, in deference to the US lifting interest rates, is mostly attributed to the deterioration in US fiscal and trade positions (the so called ‘twin deficits’ problem). Europe’s fiscal position is being repaired and the trade position is strongly positive. President Trump’s largely unfunded tax and infrastructure policies will further pressure the US’s debt sustainability over coming years. According to UBS, a further 6-10% weakening in the US dollar over the medium term is needed to stabilise the US’s international investment position. Commonwealth Bank of Australia research sees Europe’s 3% current account surplus continuing to be “a natural source of demand” for the euro rather than the US dollar. Both expect the US dollar to weaken toward 127-130 over the coming year. We also expect the euro to strengthen, supporting our overweight call on European equities. And while the US dollar may not strengthen, further (now largely expected) Fed interest rate hikes, significant repatriation flows and continued strong US dataflow should provide the US dollar some support. Can the Aussie dollar fall, even if the US dollar doesn’t lift? Does this mean the only path for the Australian dollar is higher in 2018? We don’t believe so. Since its float, the two most consistent determinants of the Australian dollar have been 1) commodity prices and 2) relative interest rates. 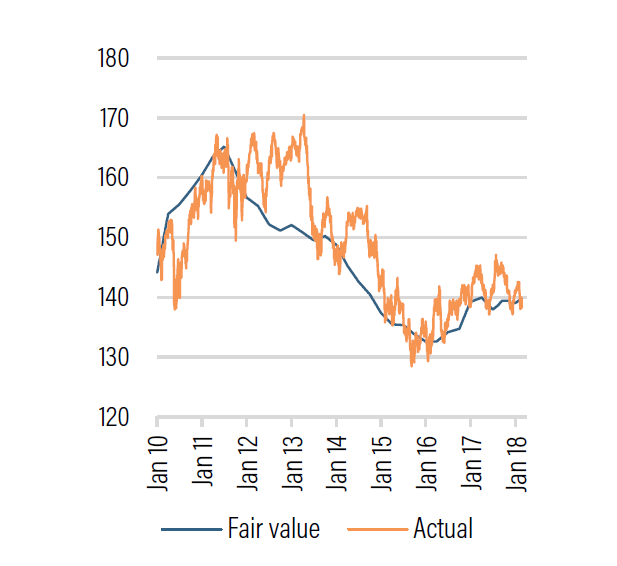 Indeed, these two drivers are the key ingredients to the RBA’s internal fair value model (replicated by UBS in the opposite chart). Based on this model, the current USD 0.78-0.79 level of the exchange rate is broadly ‘fair’. China’s economy is expected to slow moderately—China outperformed in 2017, with economic growth picking up to 6.8% from 6.7%, against expectations it would slow. But despite the strong finish to 2017, with sequential growth even higher at 6.9%, growth is once again seen slowing in 2018. Credit Suisse forecasts growth of 6.5% in 2018, with a further modest slowing to 6.2% in 2019. Commodity prices are expected to weaken moderately—Robust and synchronised global growth, producer discipline outside China, and China’s focus on reform and pollution should all help keep commodity prices relatively high. But some moderation in prices post Q4 2017’s unexpected pick-up is anticipated through 2018, with UBS’s commodity prices, as relevant for Australia, seen 7-8% lower by Q3 2018. The RBA will continue to be ‘out-hiked’ by the Fed—Although the interest rate rises in the US in 2017 put little downward pressure on the Australian dollar, three (and possibly four) further rate increases in the US this year, with the RBA seen on hold at least until Q4 2018, are likely to further chip away at the Australian dollar’s yield advantage. Indeed, Australia’s 10-year bond yield is now trading below that in the US. There is little doubt a weak trend in the US dollar will make it challenging for the Australian dollar to fall materially against it. Australia’s improving trade position, belated consolidation in the fiscal budget, as well as the now less vulnerable AAA credit rating also suggest a sharp move lower in Australia’s exchange rate against the US dollar is less likely. Nonetheless, we expect the reasons noted above will conspire to pressure the Australian dollar lower during 2018. At USD 0.75-0.77, this would see it in the middle of its relatively stable trading range between USD 0.70 and 0.80 since 2015. Arguably, volatility in the Australian exchange rate has reduced over the past few years, notwithstanding an average annual move of 13 cents! Last month we declared it too early to retreat from risk, taking a cautiously engaged view to equities and moving more underweight international government bonds. Over the month, we saw the first true correction in equities in two years (after an unusually long period of low volatility) with US markets down 10% and US 10-year bond yields jumping to almost 3%. Consistent with our thesis that the outlook for earnings growth remains strong and that we are mid cycle (not end cycle), equity markets bounced, unwinding most of the weakness in Australia and Europe, and all of it in the US. However, with the low point in inflation behind us, government bonds have held on to their losses, and yields have continued to drift higher. Further volatility likely lies ahead, as markets fear of faster-than-expected inflation ebbs and flows. With March bringing key central bank meetings in the US and Europe, as well as another batch of US wage and inflation data (a key focus given a recent unexpected pick-up), our thesis of still cautiously engaging risk may come under some near-term pressure. One of the interesting nuances of the recent correction was that the Australian dollar behaved much as we had expected! It corrected lower, falling from over USD 0.80 to about USD 0.77, a decent 4% fall. 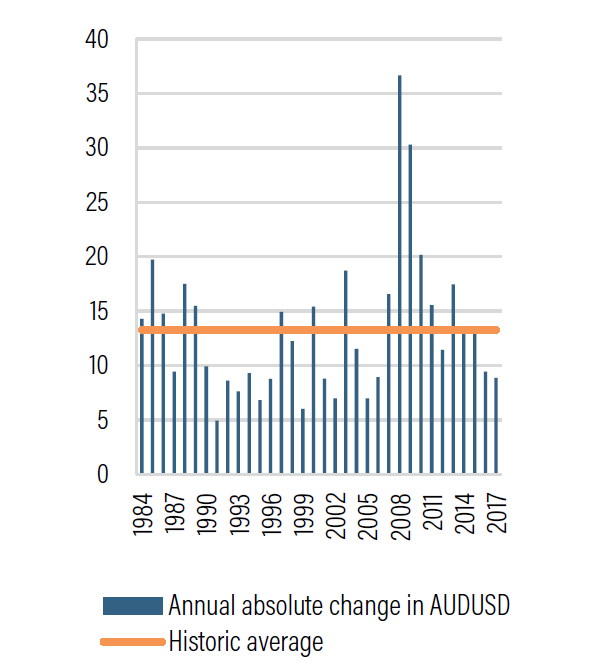 To the extent the risk of further market corrections has increased in 2018, this suggests there are good reasons to expect the Australian dollar to still play a role in diversifying risk, particularly for unhedged international equity positions. Moves toward the top of this range could be an opportunity to accumulate international equities. This is particularly true for portfolios that remain under-allocated to offshore markets. We continue to prefer Europe, where we expect euro appreciation against the Australian dollar to enhance returns. Moves toward the bottom of this range could be an opportunity to reallocate portfolios that are carrying more offshore equity risk than our strategic portfolios recommend. Increasing allocations to alternative assets remains a key focus given the more mature phase of the economic and asset cycle. Within domestic equities, companies that have significant offshore earnings may also benefit if the Australian dollar were to drift towards the bottom of its recent range. Forecasts for the Australian dollar for end-2018 range from USD 0.72-0.85. While it has been relatively sticky around USD 0.80 in recent months, we continue to expect that the combination of a weaker China growth outlook, easing commodity prices and a steady RBA as the US hikes, will combine to pressure the exchange rate lower towards USD 0.75-0.77, around the middle of its recent USD 0.70-0.80 range. the Australian dollar still retains a valuable role as a natural hedge against unexpected sharp weakness in offshore global equity markets.